I was so excited when I saw that Stampin' Up had decided to offer the Flurry of Wishes photo polymer stamp set and matching Snow Flurry punch at a discount of 20% off as part of the Online Extravaganza running at the moment. These products will only be available as a bundle at the discounted price for 24 hours on Monday 28th November. 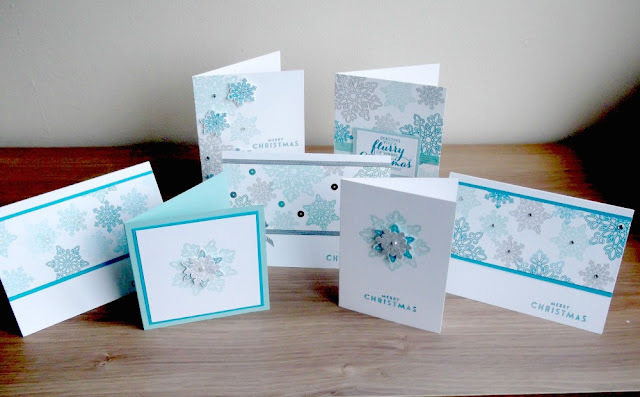 So for one day only you can get this bundle for only £28.00. An excellent investment in a set that will come out Christmas after Christmas. 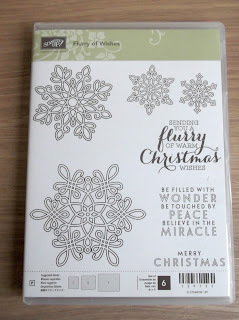 This is one of my favourite Christmas sets and I have based several classes and make 'n' takes around these products this season. The card above was to showcase what can be done with minimal product: one stamp set, one stamp pad, Whisper White card stock, Tempting Turquoise card stock. 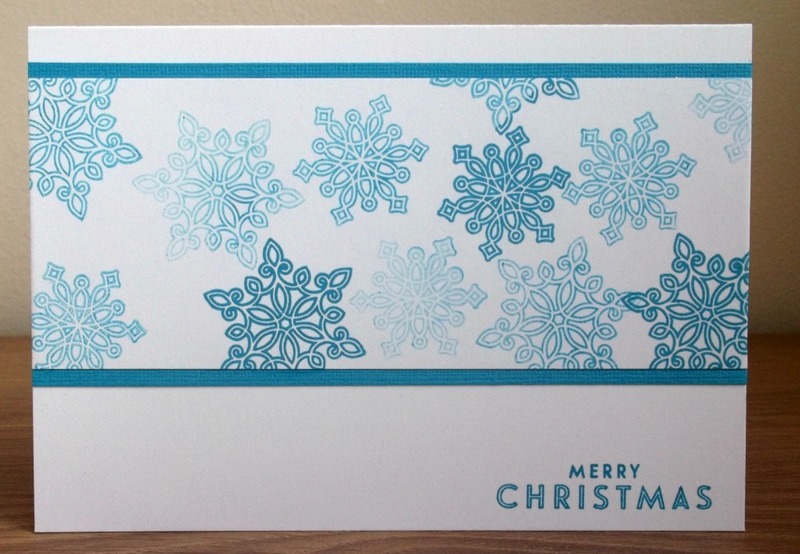 The appearance of the snowflakes in different shades was achieved by "stamping off" either once or twice before stamping the image on the card. This one was a similar design but stepped up with a few more product items: Ink pads in Smoky Slate, Pool Party and Tempting Turquoise, plus some basic rhinestones. 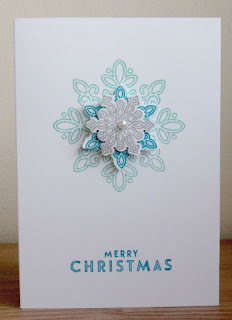 This is a really quick and easy card which would be easy to bulk make for Christmas cards this year. Again, just to showcase what can be achieved by changing a few products. 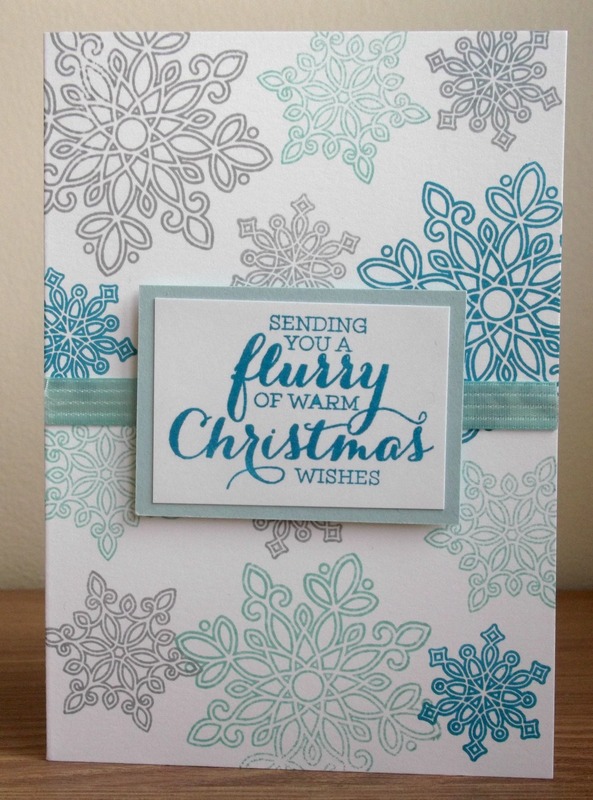 This time the ink pads used were Smoky Slate, Soft Sky and Bermuda Bay. 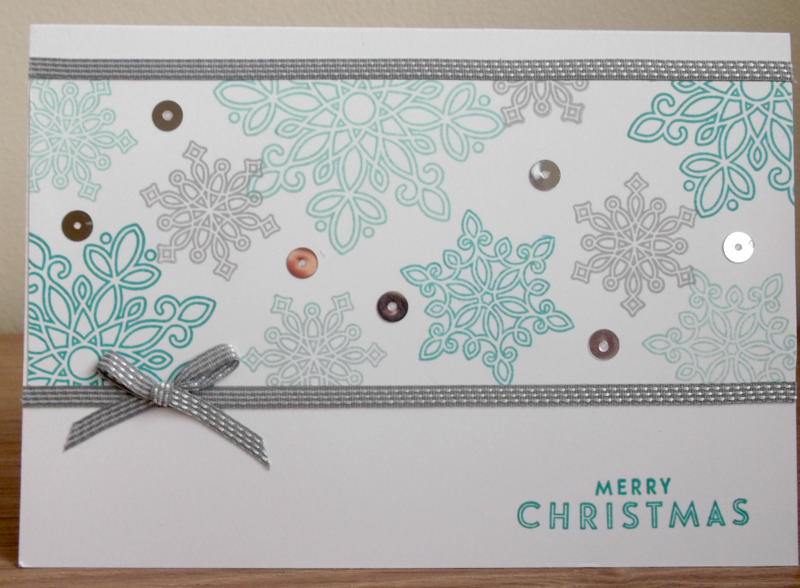 The addition of some silver sequins from the Sequin Trim and some Smoky Slate Stitched Ribbon gives a different look to the card. 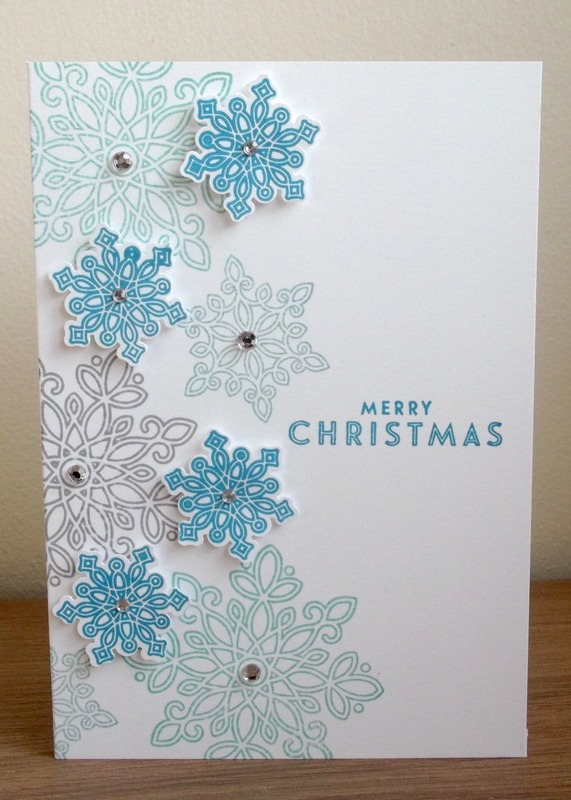 This time the punch is used to punch out a few of the smaller and medium snowflakes which are then mounted on dimensionals to give a bit of dimension. On this one, the design is stepped up by the addition of some Pool Party Stitched Satin Ribbon and by using a different sentiment from the stamp set. 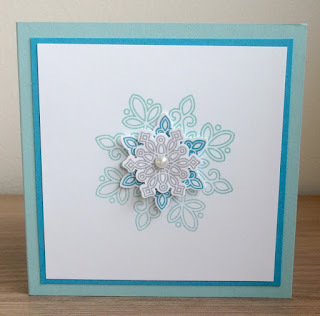 For the card above I made a Pool Party square card blank, then matted a panel of Whisper White onto Tempting Turquoise. 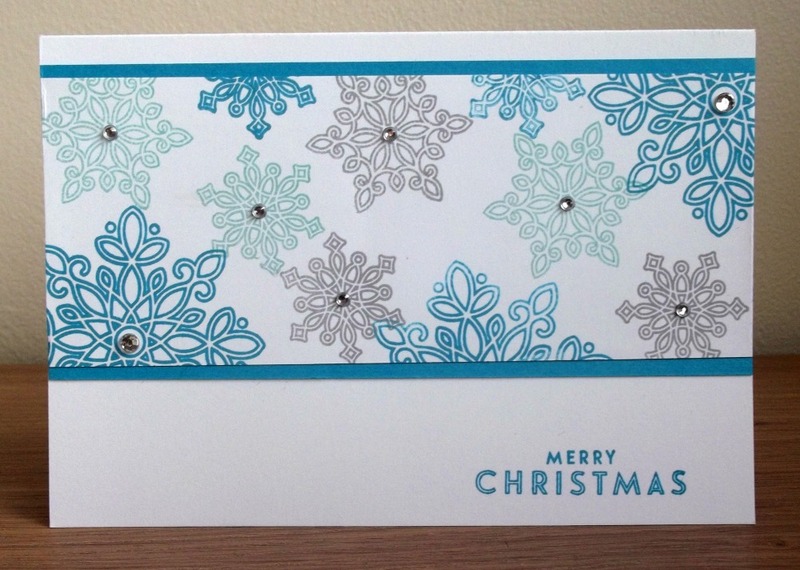 The large snowflake is stamped straight onto the card. 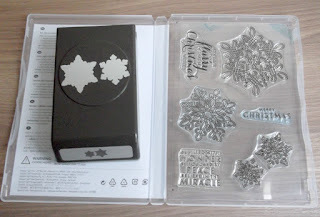 The other two are punched out and layered up using dimensionals. 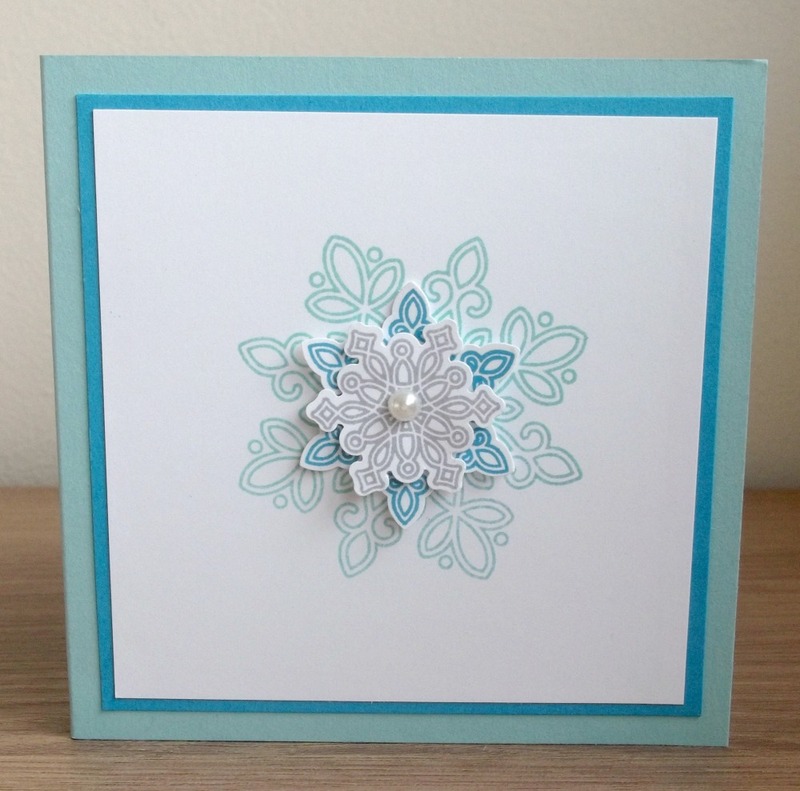 This time a Basic Pearl Jewel was used to finish off the card. Lastly, again a layered snowflake, this time using one of the smaller card blanks from the pack of Note Cards and Envelopes. Don't forget this is just one of the products that will discounted on 28th November - I'll showcase some of the others another day. And to see the full list of products available for the whole week during the Online Extravaganza (21st - 28th Nov) there’s a PDF here that you can print off and peruse at your leisure.